Ordering your caricature from Cre8ors Caricatures couldn't be simpler but before we go any further, it is essential that you understand what a caricature is. "Caricature (kar´i-ka-túr), a likeness of anything so exaggerated or distorted as to appear ridiculous. - v.t. to turn into ridicule by distorting a likeness : to burlesque." To further understand please look up the definition of the word exaggerate and we won’t need to explain why your nose or ears looks so big! We will return your photos with the artwork, first-class, all in a protective tube, ready for framing. C - Send an e-mail to this address and send your pictures and any special instructions with the e-mail. If you require courier delivery please specify in your e-mail. It's as simple as that! We will contact you if we need any further details or photos. Please remember to click the button below for each additional person or large object. eg. Two extra people and one motorcycle - click three times. Thanks. 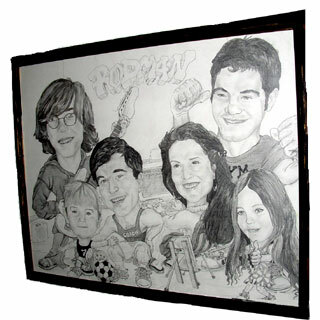 Cut to frame...negotiable to size and artist's temperament as are larger sizes of caricatures. Artist is open to negotiate depending on subject matter. Black on white family portraits do not usually exceed $200. Please use the button above to order extra characters. Add as many characters as you like - just click once for each character or object.